I don't know where the best place for something like this is, but I figured this was significant enough to report about. In the level 'Knight Time', the level is supposed to be totally dark, with you following a firefly through the level in order to see where you're going. In Dolphin 5.0 (and I mean 5.0, no patches or nothing) with DX11 backend, this effect is completely missing, making the whole point of the level moot. I don't know if the latest latest version of Dolphin fixes it but I imagine the Dolphin devs haven't done a full playthrough of Crash Bandicoot: The Wrath of Cortex on their emulator just to see one level screwed up (this level can only be accessed by beating the game + 5 relics). Maybe this broken lighting effect is part of a wider conspiracy with other games having their one-off gimmick levels ruined, but I don't know. The rest of the game works just fine (or at least, as fine as it did on Gamecube, slowdowns and all). There's some minor transparency issues in some levels too but nothing as blatantly broken as this. Can you get a 2 - 3 frame fifolog of this area? (06-30-2017, 06:29 PM)JMC47 Wrote: Can you get a 2 - 3 frame fifolog of this area? Will do. I'll have it some time tomorrow. Also, I have the game so if you have a savefile throw that on here too. Here you go. Also contains a fifolog concerning the transparency issue I also mentioned. Hope it helps! Do you know what the transparency one is supposed to look like? I odn't see what's broken. (07-03-2017, 09:37 AM)JMC47 Wrote: Do you know what the transparency one is supposed to look like? I odn't see what's broken. To be specific, it seems to happen whenever two transparent objects overlap each other, with the entity seemingly always appearing in front of the environment. 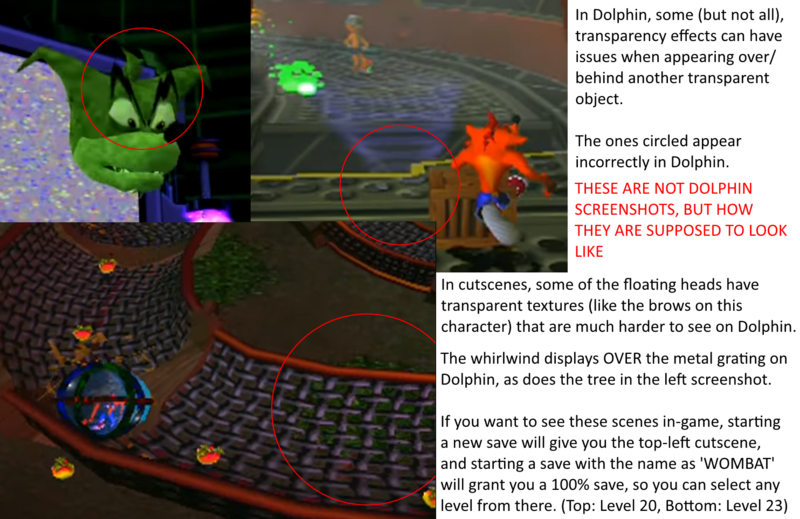 Picture shows what they are supposed to look like, but do not display correctly in Dolphin. In the case of the whirlwind, you'd be able to see the bottom of the whirlwind in front of the metal grating as opposed to behind it as it should be.